Hyderabad, April 10: Elections for the 17 parliamentary seats in Telangana, being contested in the ongoing phase 1 of Lok Sabha polls 2019, has concluded. Voting began at 7 am and continued till as late as 6 pm in most of the constituencies barring 13 assembly segments spread across five seats, where the polls ended at 3 pm due to the threat posed by left-wing extremists. A voter turnout of 60.57 per cent has been recorded. Telangana Lok Sabha Elections 2019 Schedule: Constituency Wise Dates Of Voting And Results For General Elections. A total of 34,603 polling booths have been earmarked by the Election Commission for the conduct of polls. The state's electorate size is nearly 2.97 crore -- of which, 1,504 voters belong to the third gender. 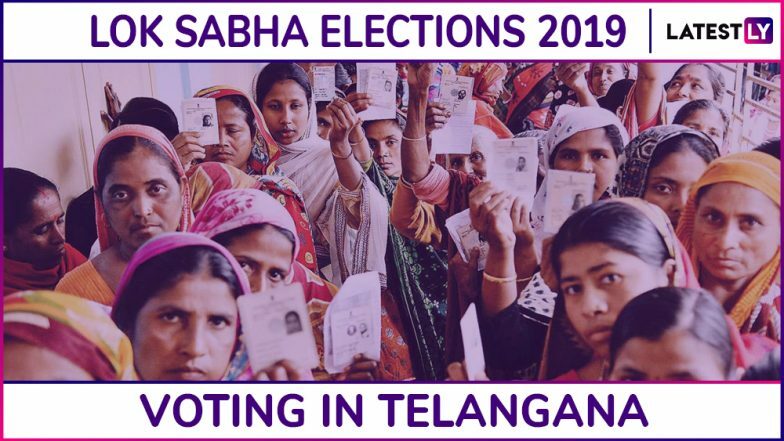 Hyderabad Lok Sabha Constituency in Telangana: Candidates, Current MP, Polling Date And Election Results 2019. The 17 parliamentary seats witness a collective candidature of 443 aspirants, including 418 male and only 25 females. Among the key candidates are sitting TRS MP from Nizamabad, K Kavitha, who is also the daughter of Chief Minister K Chandrasekhar Rao; former Union Minister and top Congress leader Renuka Chowdhary, contesting from Khammam constituency; AIMIM president Asaduddin Owaisi from Hyderabad and state Congress unit chief N Uttam Kumar Reddy from Nalgonda. One of the intriguing features of the ongoing polls is the electoral battle in Nizamabad, where 185 candidates are in the fray. The mass nominations were filed by 170 farmers, as a mark of protest against the ruling TRS in the state and BJP at the Centre for not raising the remunerative prices for turmeric and red jowar. Despite the high number of candidates, the Election Commission remained vehement on conducting the polls using EVMs instead of reverting to ballot papers. 12 voting machines have been placed in each booth of Nizamabad constituency to include the names of all candidates. In the last parliamentary polls held in Telangana, the TRS had succeeded in winning 11 Lok Sabha seats, whereas, the Congress was restricted to 2. The BJP, TDP, YSRCP and AIMIM had won 1 constituency each. The sole-elected lawakers of YSRCP and TDP, along with 1 Congress MP, crossed over to the TRS after the polls. KCR, as the TRS chief is popularly called, returned to power with a resounding mandate in the recently contested assembly elections. With a two-third majority, the ruling party won 88 seats, whereas, the Congress could bag only 19. The BJP was restricted to 1. In a jolt to the Congress last month, 10 legislators of the party joined the TRS. According to KCR, his party would win 16 Lok Sabha seats, whereas, the Hyderabad constituency would be retained by Owaisi. The Telangana CM is hopeful that he would play a critical role in the formation of the next government at the Centre.